Our Best of Holland Tours includes a visit to the fisherman villages Marken, Volendam, Edam and Monnickendam. Broek in Waterland: we will do a walk in this very picturesque village with a rich history. During our golden age of 17th century it was the settlement of shipowners, captains, and rich merchants reignited the economy of the village. The town has majestic houses with wonderful interiors from that era. Perhaps we will visit the small protestant church of Broek in Waterland. Monnickendam: a little city with around 10,000 inhabitants, known for its smokehouses, cheese, and shipyards. It’s a lively city with many charming streets. With its four yacht harbors, it has also become a popular boating area with many classic klippers and tjalken. Edam: a lovely, typical dutch village, world famous for its Edam cheeses and Edam cheese market. Edam however, has much more to offer. Beemster and Schermer polder is on the list of Unesco World Heritage. Schermerhorn: a visit to the less touristic windmills of Schermerhorn. Here we can go all to the top of a working windmill and the miller will give an exlanation of his work. In April and May we tour the magnificent flowerfields of Keukenhof, the garden of Amsterdam. The Hague, seat of the Dutch government, Rotterdam and Delft. Dutch culture and history of our Golden Age during the 17th century. Holland North, Holland South, Route East, Friesland or Utrecht. Picturesque dike towns, colourful markets and traditional Dutch fairs. With a Mini Bus 8 seater. Perfect for small sized groups touring enjoyable journeys through all Amsterdam’s small alleys. € 300 or USD 360 for a 4 hour tour. € 520 or USD 610 for our Grand Holland Tours (at least 7 hours). Additional hours or hours less € 75 or USD 88. 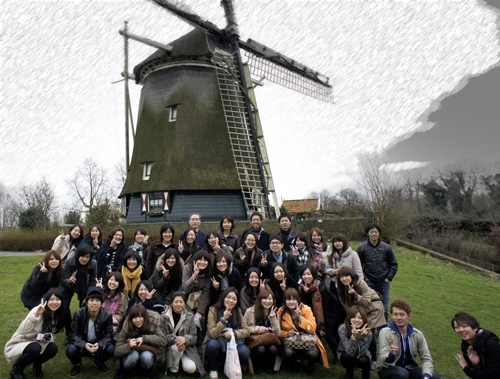 Our Best of Holland Tours are best in combination with our Amsterdam City Tours. Independent information about the Netherlands you’ll find here. See Holland and do the Amsterdam city tour.